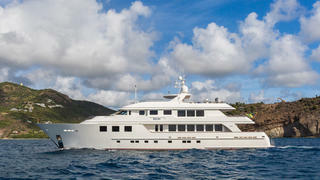 The 44 metre motor yacht Mim has had a central agency change and is now listed for sale by Mark Elliott at IYC. Built in aluminium by US yard Burger to ABS class and MCA coded, she was delivered in 2006 with a multimillion dollar refit in 2015. A classic interior in raised and fielded African cherry wood accommodates 14 guests in seven cabins consisting of a master suite, four double cabins and two twins, all with en suite bathroom facilities. In addition, there are quarters for 10 crew in five cabins. To starboard in the main saloon, a pair of glass doors open out onto a drop down sea balcony while forward is a large dining table with seating for 12 guests and storage for glassware, china and cutlery. The lounge area has L-shaped settees, four comfortable armchairs, and an entertainment centre including a 38 inch Vizio flat screen television on a rise and fall mechanism. The open aft deck of this yacht for sale has upholstered bench seating aft, a dining table and chairs seating 12 guests for al fresco entertaining and dining. Up in the full beam sky lounge there are nearly full height windows offering abundant sunlight while furniture includes three settees to port, starboard and aft, and an entertainment centre featuring a 56 inch Samsung flat screen television and a stereo surround sound system. The expansive sun deck has a Jacuzzi tub forward with large sun pads, a full wet bar, gas barbecue grill and an ice maker, all sheltered by a hard top. A popular charter yacht, Mim completed her 10 year ABS survey in 2016 and could continue to provide an income for a new owner in years to come. Twin 2,775hp MTU engines give her a cruising speed of 13 knots and she is fitted with Quantum zero speed stabilisers. Lying in San Juan, Puerto Rico, Mim is asking $14.9 million.